Rebate processing jobs are getting increasingly popular on the Internet, and this trend has resulted in the burgeoning of phony companies, and scam sites promising misleading returns to gullible customers. Here's the entire truth on the current home business fad on the Internet. What are Internet Rebate Processing Jobs? Though the term itself signifies that the job profile includes simple form processing and information computing work, a rebate job advertised on the Internet is often a far cry from a traditional rebate processing job. There are a lot of rebate jobs available on the Internet, but most of them are affiliate marketing opportunities that are cleverly offered in the illusory garb of rebate processing. There are several sites that will claim to offer you true rebate processing opportunities at a nominal price, only to end up offering you an amateur tutorial about picking up products from affiliate marketing sites like Clickbank, Commission Junction, etcetera, and selling them for a commission. There are a few good companies that for a onetime fee offer you great value and access to several marketing sites, software tools and great tips for making valuable commissions, however, most of them offer zilch value and no support and assistance to make any real money for you. A real rebate processing job can offer decent returns and the opportunity to literally work in your pajamas from the comfort of your home. In addition to this, the actual job is quite simple and doesn't really require intricate effort. Do thorough research on the Internet and go through several forums, community boards, discussion threads and social networking sites to zero down on a legitimate work-from-home rebate processing program. Typically misleading claims will be 'thousands of companies require rebate processors 'or 'make $ 100-$ 200 an hour by simply filling and submitting easy forms'. Whenever the rewards seem unusually disproportionate to the effort and skills required, there is always a hint of a potential money making scam. A true rebate processing job doesn't require you to market or promote the company's products, but simply process forms administratively and be paid a nominal sum for every processed document. There aren't any sales, commissions or clicks to keep track of. It is very difficult to find genuine rebate processing jobs on the Internet, but if you look through specialized, administrative work-at-home communities and forums, you may find them. 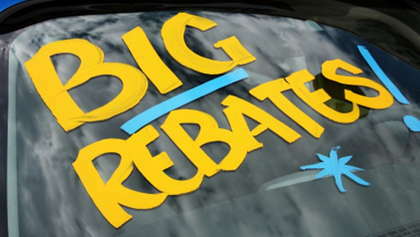 The best way to go about it is to find local companies that are looking for online rebate processors. They may not boast of an excellent pay, but you won't have to pay them an upfront fee unlike other online rebate processing jobs. A traditional rebate processing job requires a flair for precision and an eye for detail to avoid committing the minutest errors. Since the job is highly administrative and monotonous with minimal scope for creativity, attributes like patience, diligence and a hard-working disposition are crucial. A real rebate processing job can pay anywhere between $ 5- - $ 20, and even more, depending on the company (per processed form). An online rebate processing job may often be starkly different from what it is projected to be, and hence it is critical to thoroughly scrutinize the available opportunity, and check factors like initial investment, compensation and conditions for earning the compensation. Hundreds of rebate processing jobs offered on the internet are nothing more than affiliate marketing tutorials that give you information on earning commissions by promoting other's products.